"I cannot allow us to be killed." OMFG. This looks awesome!! BH Tilt has dropped the first trailer for a sci-fi action thriller titled Upgrade, which premiered to some of the best buzz at the SXSW Film Festival. I kept hearing about this one, and I can't wait to see it. 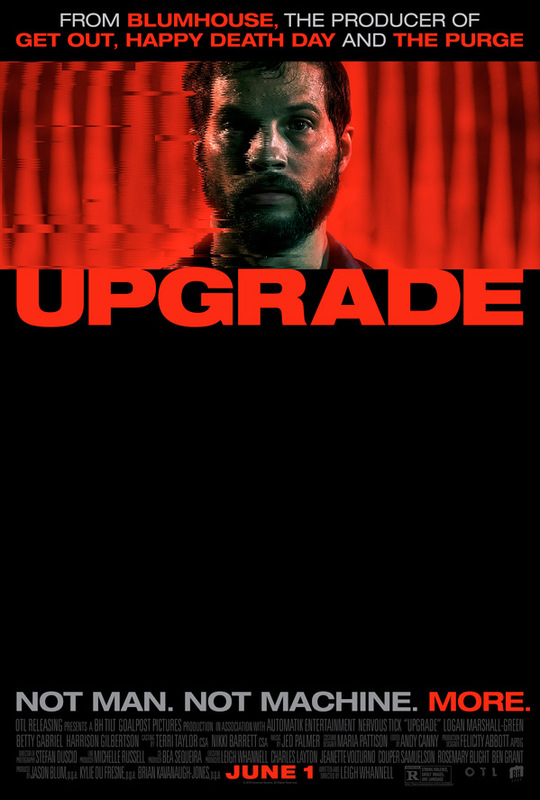 Upgrade a "thrilling and hyper violent vision of the future", written & directed by Leigh Whannell, co-creator of Saw and Insidious. Set in the near-future, technology controls nearly all aspects of life. But when Grey, a self-identified technophobe, has his world turned upside down, his only hope for revenge is an experimental computer chip implant called Stem. Logan Marshall-Green stars, with a cast including Betty Gabriel, Michael M. Foster, Harrison Gilbertson, and Benedict Hardie. I'm so in for this, bring it on! Love the way the camera tilts when he stands up. Hell yes. After his wife is killed during a brutal mugging that also leaves him paralyzed, Grey Trace (Logan Marshall Green) is approached by a billionaire inventor with an experimental cure that will “upgrade” his body. The cure - an Artificial Intelligence implant called STEM - gives Grey physical abilities beyond anything experienced and the ability to relentlessly claim vengeance against those who murdered his wife and left him for dead. Upgrade is both written and directed by Australian actor / writer / filmmaker Leigh Whannell, co-creator of the Saw series, and director of the film Insidious: Chapter 3 previously. This first premiered at the SXSW Film Festival earlier this year to rave reviews. BH Tilt will release Leigh Whannell's Upgrade in select theaters starting on June 1st this summer. Get ready for this film. Who's down for this?